Millennials (18—34 years old) say they use Twitter because it brings fun and laughter into their lives. 47 percent agree that Twitter means "laughing" or "a cure for boredom" and when they come across a funny Tweet, 82 percent share it, according to a new study from Twitter blog and DB5. The study also found that 8 in 10 Millennial users access Twitter on a mobile device, while 6 in 10 tweet at least once a day. Millennial use Twitter to tell their own stories, 57 percent use the social network to share fun activities and 42 percent use it to share their photos. 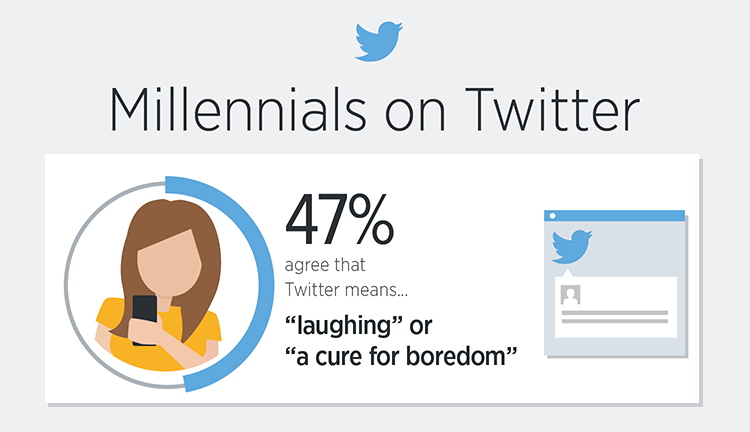 Take a look at this infographic that unveils 4 insights about millennials on Twitter.